Theresa's Mixed Nuts: Oh My Gourd! 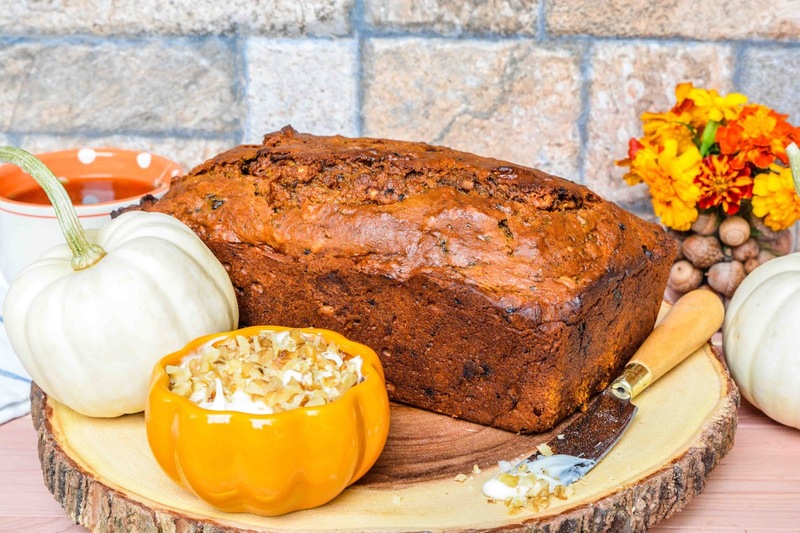 Pumpkin Nut Bread! Oh My Gourd! 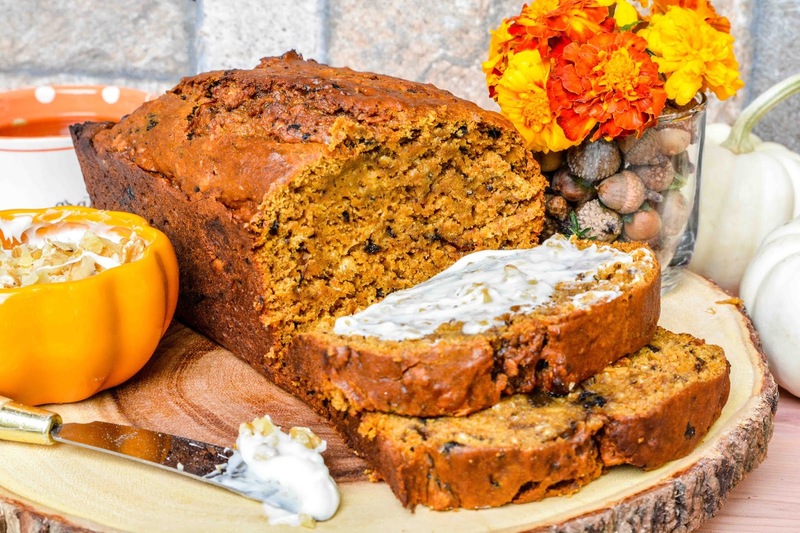 Pumpkin Nut Bread! Does anyone else get sucked into the baked goods section at the grocers? I do every dang time! Jason and I were doing our usual grocery run when we walked past a display of fall baked goodies. "Oooh! I need to buy a loaf of that pumpkin bread!" That was me getting caught up in the moment of impulse buy city, but my high didn't last long because Jason wasn't having it. "We don't need that. Bread is bad for you. Why do you bother working out if you're just going to gorge on stuff like this?" What a buzzkill! I work out so I can gorge myself on baked goodies! Well, I had the last laugh because I when I came home I still wanted some pumpkin bread, so I made my own. I was saving this Pumpkin Nut Bread recipe from Golden Blossom Honey for Thanksgiving breakfast, but bumped it up the list to satisfy my craving. This recipe called for the addition of blended prunes, so I used up my bag of probiotic prunes which actually makes this a healthy recipe, right? Well, at least that's my story and I'm sticking to it. I did whip up a cream cheese spread mixed with chopped walnuts for a sweet addition. Served with a hot cup of tea or coffee, it's an indulgent way to enjoy a snack on a chilly fall day. What's your favorite thing to buy from the bakery section at the grocers? I also always wondered if probiotics disappear during baking if we put them in something that goes in the oven? I am sure I probably killed off the health benefits of the probiotics after it went into the oven. Probably works the same way when you kill off all the healthy benefits of honey by heating it. yes, I checked it out last night, probiotics die on temps above 100F, so we get nothing if we use it instead of regular yoghurt in baking. Dahlink, I stopped drinking probiotic yoghurt three weeks ago in my latest stage of total vegetarianism and my face has totally cleared in a week, my digestion is much better (go figure) and my goosebump skin on the uppeararms has started disappearing as well (I read somewhere before it is also caused by dairy). I'm still taking two probiotic pills a week. I've upped my take of sesame seeds a day to replace calcium from yoghurt and I'm also trying to eat pickles, although you have probiotics only in the salty pickles not in the one done with vinegar. That's wonderful that you are seeing such great benefits from cutting out the dairy yogurt. I remember how horrible my skin got after cutting meat from my diet. I am sure it's because my body was detoxing, but it took about 5 months for it to clear up. Now, I've got really good skin. I hope these changes continue to be beneficial for you dahlink! Yes, that was because you changed your diet drastically. I think the biggest detox effects are when you ditch sugar and everything refined, that is when some people even start fainting from the impact of detox. Not us, but some people, especially when they start drinking those green powerful smoothies and stuff. If you did not have the problem with your immune system you would experience the good sides by now too, like absence of flu and cold and such things. Did you notice any other changes except better skin? I didn't get sick at all last winter, so I did notice that. I was surprised since my immune system is stripped down so, I thought for sure once everyone else in the house got sick it was going to hit me to, but I managed to evade it. Hopefully this winter will be the same. Where are you getting your fresh produce if your store is closed? I'm happy to hear it and I knew it would be so :) Us keeping our hands clean and obsessing with hygiene also plays a huge part. We have a little green market (just three or four stalls) 500meters from my house across the said store, along with a newspaper stall, and smugglers from Hungary :) I buy fruit and veggies there, and now have to go for everything else downtown. Since the stalls are out in the open I'm only afraid they won't have fresh produce for a long time now that the temps have gone zero last night! Their veggies tend to freeze out in the open and the store won't be done with renovation for about a month or so. Can't buy it, make it. haha showed him at your sea. That sounds amazing! I love these types of breads, but I've never had one made with pumpkin before. I can't wait to make this! It's really moist and delicious! I had pumpkin bread for the first time a few days ago. It was amazing. We've been looking for a recipe to make, so this is perfect timing. I hope you enjoy, Bill! I love pumpkin nut bread. My mom used to make us a loaf every christmas. I have her recipe but I haven't tried to make it since she passed away. I love pumpkin nut bread! I like to eat it warmed up, with butter and cream cheese! This recipe looks tasty! Yes, it's so good warmed up! This is the kind of Fall treat I need to start making! Gosh that sounds so good, especially with the cream cheese spread. It looks so good! And I agree, I workout so I can eat what I want! I think this recipe is perfect for Fall and Winter seasons. Especially with a good cup of tea or coffee. I know! Why workout if you can't treat yourself to the things you love? That looks so good especially with the cream cheese spread that you made. This is something that I wouldn't mind eating all the time, lol. Thanks for the recipe! I love this recipe already and I haven't even tried it! It's looks really yummy and it's not dry too, which I love. It's definitely worth a try. Definitely not dry at all. I was worried about it being dry with the addition of the oats, but I think the prunes give it a boost making it very soft and moist! Yum, this looks so good. I have never made a bread with prunes in it before. Gosh, you come up with the most delicious recipes. This sounds SO good. A winner for Thanksgiving dessert too! That loaf of bread looks so moist and delicious. I will have to try this recipe. Nothing beats homemade bread with your own choice of add-ons. Yum. Homemade bread is the best ever. Your recipe for pumpkin nut bread looks easy to follow and most of the ingredients I already have in my pantry. I'm making this over the weekend. Hopefully it will turn out to be as moist and delicious looking as yours. Send me all the pumpkin bread! I could eat it for every meal of the day! This nutty version sounds delightful. I'd do without the prunes but that certainly looks delicious. NomNom!! That looks yummy! My favorite bakery item has to be either cheesecake or key lime pie! However, when it comes to bread my favorite is at Harris Teeter - they have the most amazing Jalapeno Cheddar Bread that is so good dipped in their brand Sauteed Onion Hummus. Soooo good! Now I wish I had a Harris Teeter. That bread sounds amazing! And sauteed onion hummus? Nom! It is soooo good. I ran across it kinda by accident. They had one of the bakery ladies passing out samples of different breads and hummus, and that happened to be the one I got - I never would have bought either of them on my own...but I was sold as soon as I tried it. It doesn't last long in the house either, and is great for when company is over. I love flavored breads. This does look wonderful! In Nova Scotia where I am originally from, we used to call this type of bread a tea bread. With prunes and pumpkin and oatmeal and honey, this is a healthy food! I've bookmarked the recipe for when I get back home from Calgary. Can't wait to try it! I don't think I have ever heard anyone call bread tea bread before, but as one who loves tea, I think I love calling it that. It really does have quite a few healthy ingredients in there, so I don't think it's as bad for you as other types of breads.